I make this waffle recipe more often than any other that I have tried. It is a great way for me to use some of my sourdough starter (without the commitment of all-day-bread-making). It is another overnight recipe, so it does need to be started the night before. I find this more convenient than mixing batter in the morning. I make the batter after the kids go to bed, and they are ready to cook with minimal effort in the morning. These waffles are slightly tangy, like the Yeast Raised Waffles, but the flavor is not as “yeasty”. Just how sour the waffles taste will depend on the strength of your starter. My kids especially like these waffles. They are very light and airy, with great pockets inside and out for soaking up syrup or other toppings. For Waffle Tips & Strategies, click HERE. When you are ready to make the waffles, preheat a waffle iron according to the manufacturer’s instructions. In a small bowl or liquid measuring cup, combine the eggs and oil. Add to the overnight sponge. ** Mix in the sugar, salt and baking soda, stirring well to combine. The batter will bubble. Pour the batter into the preheated waffle iron and bake according to the manufacturer’s instructions. 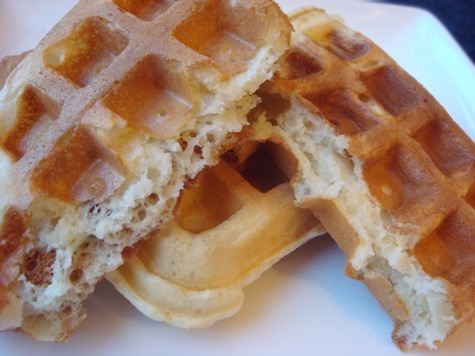 Use slightly less batter than usual (I use a very scant ½ cup batter in each section of my waffle maker), as the batter will continue to rise and spread in the waffle maker. Remove waffles from waffle maker and place on a wire rack (not a plate). Serve immediately or keep warm in a warm oven (very low heat). **SOURDOUGH STARTER NOTE: Sourdough starters can have different thicknesses (hydration). After adding eggs in the morning, if the batter is too thick to scoop with a ladle or measuring cup, add a little bit more buttermilk. The batter will have a different consistency than normal waffle batters: it should be like a thin bread dough, be thin enough to scoop, but not thin enough to pour.